1) Your hardware key is not connected. Connect your hardware key and start E-Studio again. 2) Your hardware key driver is not installed/configured. If the HASP/SafeNet Admin Control Center cannot detect your hardware key, then remove the hardware key and install the latest HASP/LDK driver from the Gemalto Sentinel Customer Community. Note that a reboot of the machine may be required after installation. A reboot may be required after installation. 3) There is an issue with your installation or an incomplete upgrade from previous version. Uninstall E-Prime, then remove files from the E-Prime installation folder (eg. 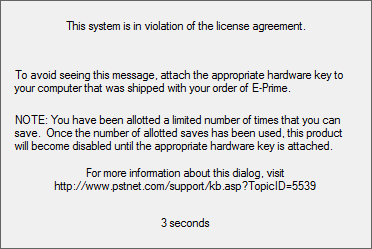 C:\Program Files (x86)\PST\E-Prime 2.0\Program) and install again. 4) The HASP service is being blocked. Please disable any firewalls or anti-virus programs and reinstall the HASP driver. 5) The HASP service is not started. Please check to see if the ‘Sentinel HASP License Manager’ or 'Sentinel Local License Manage' is running by using Run (from the Start menu) and type "services.msc" (sans quotes). If the service is listed but stopped, please start the service by right clicking and selecting Start. 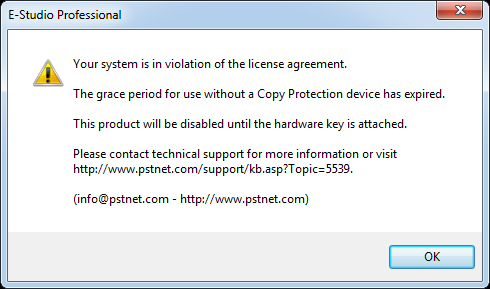 If the above steps do not resolve the issue, please run http://www2.pstnet.com/downloads/e-prime/2.0/temp/E-Prime2LicenseDiagnostics.exe while the hardware key is connected. Three or four files will be created on your desktop; please create a ZIP archive containing all of these files and attach the ZIP to a new support request.